See here for a fact sheet with a table of contents. You’ll find the general index here and the county index here. NEW! 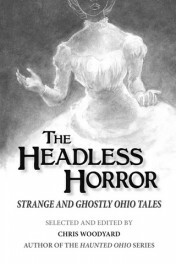 #2013 The Headless Horror: Strange and Ghostly Ohio Tales, Chris Woodyard, 2013, 272 pp., notes, bibliography $16.95 NEW! The latest book from Haunted Ohio author Chris Woodyard, The Headless Horror, collects the stories that would not die…..
Over a century in the making, Haunted Ohio author Chris Woodyard has unearthed another collection of Victorian and Edwardian ghosts, mysteries, and the strange. In addition to stories of hoodoo houses, haunted prisons, Women in White, and malevolent objects, you’ll find the Bloody Hand of Findlay and other visions in the sky, early UFOs, witches, spook lights, and such Fortean oddities as a fall of snails, toads found in rocks, and a woman with live lizards in her stomach. A special feature is the chapter on the paranormal history of poor, pitiful Pearl Bryan, murdered in 1896, and who returned–headless–to a Cincinnati seance. In The Headless Horror you’ll find bizarre stories about fish falls, a village terrorized by phantom black cats, and a woman who kept receiving letters from her husband, seen dead and buried by hundreds of witnesses. You’ll meet a mysterious ghostly Frenchwoman who threw herself off a roof in Akron, a coffin-maker haunted by his future clients, and a man driven mad by a spook light. You’ll read the reports by a group of Crawford County men who investigated a haunted house, not once, but twice, and saw the ghost of a man they had all known in life, and who seemed to see them. You’ll read the testimony in a sensational Spook Trial in Marion, where a renter who broke his lease claimed the house was haunted—and won. Full of long-unseen reports The Headless Horror is a treasure-trove of all-new stories, unearthed from old newspapers, county histories and 19th-century journals. The book contains over 120 true stories of ghosts, haunted houses, spirit photographs, vampires, spook lights, and poltergeists from 59 of Ohio’s 88 counties. 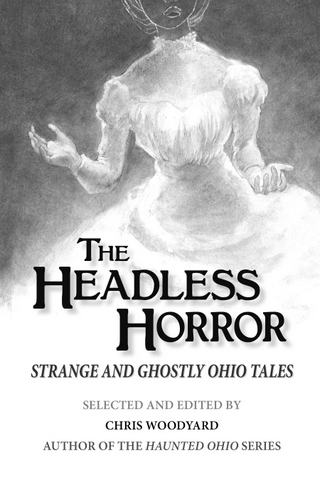 The Headless Horror is a chilling glimpse of Ohio’s ghosts of the past.